Why would I ever color my hair? 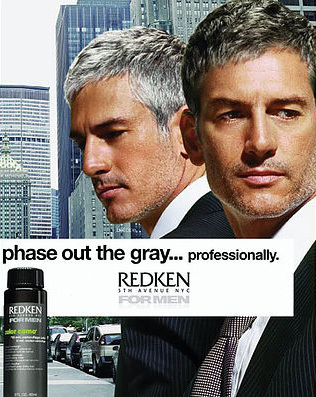 For some men, going grey is something they want to do gracefully. They feel they’ve “earned” their shiny whites; they feel it makes them look more distinguished. On the other hand, there are those who want to feel and look like they did ten years ago. Not only does the salt take over the pepper over time, but your hair also starts to lose its shine. 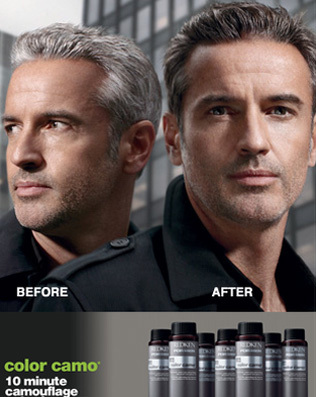 Without the variation of color and luster, going grey can age your look. Will everyone be able to tell? Different results can be acheived depending on the underlying shade used (Color Camo comes in six base shades) and the amount of processing time allowed. Men's Color Camo is dimensional, which means it isn't one, all-over opaque shade. It picks up and accentuates your hair’s natural colors, blending your gray subtly. The result is unobtrusive, translucent and natural-looking, not obvious, heavy or opaque. Its aim is to take the noticeable edge off the color gap between the gray and pigmented hair for a subtle and natural-looking transformation.